Facebook and Twitter are getting into the World Cup spirit with dedicated pages for the grand event. Twitter recently issued an app update with the specific addition of new World Cup features. Country codes now turn into “hashflags” and a search of #worldcup brings up an entire page, dedicated to the most interesting updates on the event’s progress. Facebook has also created a hub called Trending World Cup. It’s been a long time since we had hashflags in Twitter, but everyone seems to be enjoying them already. 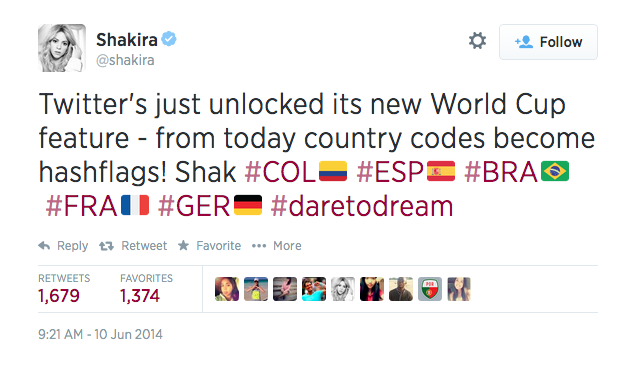 Shakira tweeted several hashflags, including #COL for her home country and #ESP for her soccer playing husband Gerard Pique, to announce the return of the feature. On the explore #worldcup page, Twitter has added a scoreboard with a list of upcoming matches, so that you can keep track of all your favorite teams and their best competition. Several tweets are already up in the new trending category, and the page is sure to explode in the coming days with the opening game between host country Brazil and Croatia. At Facebook’s Trending World Cup hub, you’ll see all the most important updates from your friends and others regarding the tournament’s progress. The hub will have scores, news, as well as posts from the players and the teams. Facebook also added an interactive map, so you can see how different countries react to the results in real-time. You can also share your thoughts on the hub while watching the matches, using the smiley icon. If following these trending pages on Twitter and Facebook isn’t enough to satisfy your hunger for World Cup news, you should also check out our list of the best World Cup 2014 apps.